This za'atar (or zaatar) deviled eggs recipe will let everyone know that you're better than them. Especially that one person that you're cool with even though you secretly hate them. We all have that person in our lives. Instead of telling them how we feel, we smile in their faces and rip them to shreds with our eyes. Make this and they'll be so jealous they will actually cry themselves to sleep while they still have the amazing taste of these zaatar deviled eggs in their mouth. Za'atar is a Middle Eastern spice mixture that has thyme, sumac and sesame seeds in it. It's a little tart and a little earthy. Traditionally, it's served with labneh, a super healthy kefir yogurt/cheese that you can make yourself by using this super-easy recipe, or on flat bread to make a yummy savory pastry known as mana'eesh. You can find it at most Middle Eastern markets or online. I get a big batch online and it lasts for months. Ok, so let's get to the recipe. Start by boiling the eggs, peeling them and cutting them in half. (Foolproof hard-boiled eggs recipe in the recipe card at the end of this post). Add a drizzle of tahini. Tahini is just sesame paste. 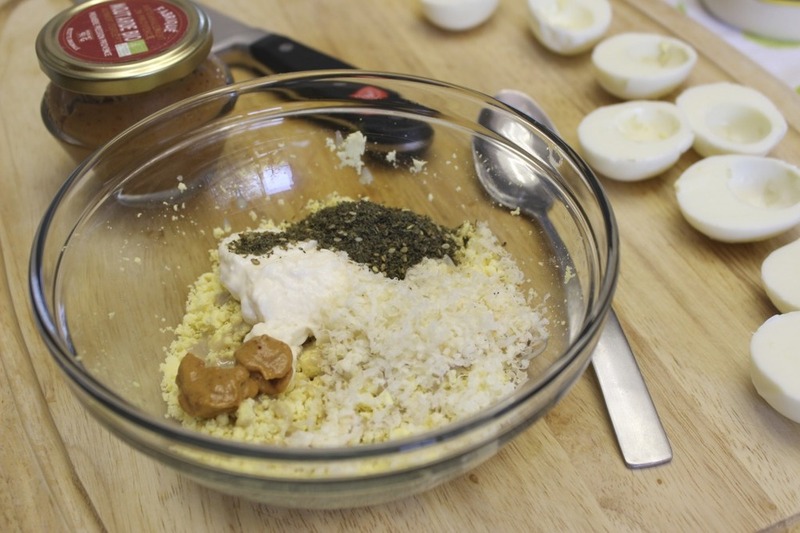 It's a main ingredient of hummus and it will give these deviled eggs a little more complexity. To this, add some mayo, mustard, as much cheese as you like and a spoonful of za'atar. Taste the mixture and adjust it to your liking. More mustard if you prefer more tang. 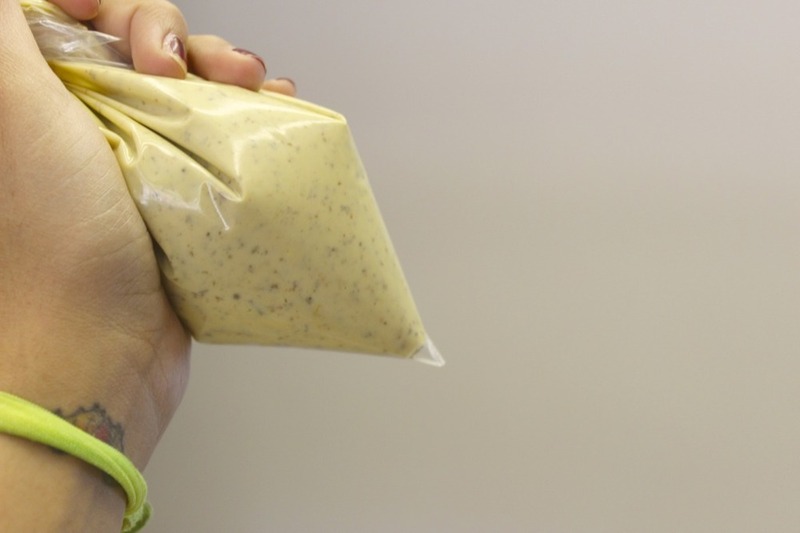 More mayo or tahini for creaminess, a touch more cheese for added saltiness. Once the filling is just right, place it in a ziploc bag, cut the tip off and pipe it into the egg halves. As a final touch, sprinkle on a little more za'atar and some sumac if you have some. Also, if you want to help me help you please subscribe to my blog and that will help me help you give the haters something to hate on. Because we all know that our haters are our motivators. Boil eggs for 5 minutes. Then turn off the heat and cover the pot. Let it stand for 10 minutes and then fill the bowl with cold water. When they are cool enough to handle, peel the eggs and slice them in half lengthwise. Scoop out the yolks and mash them with a fork. Add all the ingredients (except for the ziploc bags, obvi) to the yolks and mix until smooth. Taste and adjust for seasonings. If it needs more zing, add mustard. If it's too dry, add a bit more mayo. If it needs some more salt, add a touch more cheese. You get the idea. Once the yolk mixture is to your liking, place it into a ziploc bag, snip the tip of the bag off and pipe the filling into the egg halves. Sprinkle on a little za'atar and sumac for garnish.